Have you ever wanted an effective and therapeutic Music Therapy Resource that you could use for people with cognitive impairment that stops their behaviours and unlocks their love of music?? A music activity handbook for music therapy for people with dementia. Have you ever thought I know music works well for people with dementia but I am not musical?? I HAVE THE ANSWER FOR YOU with Among My Souvenirs Music Activity Pack for People with Dementia, available to purchase from my website . 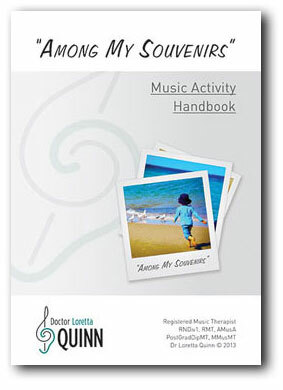 I have incorporated all of my Music Therapy and Nursing knowledge and experience of dementia into CD of songs and an accompanying handbook of simple instructions titled Among My Souvenirs: Therapeutic songs for people with dementia and Among My Souvenirs: Music Activity Handbook, which together is Among My Souvenirs Music Therapy Activity Pack for People With Dementia. This resource gives you not only a Planned Music Activity Program, but provides Instructions and Diagrams to make implementing this program as easy and enjoyable as possible. So what is Music Therapy??? the planned and creative use of music for maintaining health and well-being, in this case, people with cognitive deficit and/or dementia. The focus of Music Therapy is on improving or maintaining the health and well-being of people with (in this case) dementia and not on the actual music performance itself, which is why it is called “Music Therapy” (AMTA website). Music and movement (socialisation and exercises) People with cognitive impairment can lose their ability to socialise with each other, so using songs such as The Hokey Pokey, The More We Are Together and Jolly Good Company guides them to look, laugh and talk with other people around them! !The exercises to music target all the major joints in the body, from head to toe, catering for all levels of mobility (from walking to wheelchairs)! These exercises aim to improve joint movement and muscle strength, decreasing the risk of falls, improvng mood and cognitive functioning (Barnett et al., 2004; Borst, 2004; Heyn, Abreu & Ottenbacher, 2004; Kemmler et al., 2010; Kimura & Hozumi, 2012; Logsdon, McCurry & Terry, 2007; Macaluso & De Vito 2004; Simek et al., 2012, Waters et al., 2011; Williams & Tappen, 2007). Word Cueing As the cognitive deficit/dementia progresses, people can have increasingly difficulty stringing sentences together and finding the right word to say, which can also happen when they are singing (Bourgeois & Hickey, 2011; Haak, 2002; Hopper & Bayles, 2001; Quinn, 2012). Word Cueing offers them the opportunity to focus on singing specific words, or lines of song. In Among My Souvenirs: CD and Handbook there is simple step by step instructions on how to implement the “Word Cueing” activity, using specifically chosen songs from the CD including “Always”, “Walking My Baby Back Home” and “All By Yourself In The Moonlight” https://drlorettaquinn.com/music-resources/cd-for-people-with-dementia/. Instrument Playing Playing instruments (in particular percussion instruments) to familiar music has been shown to decrease dementia-related difficult behaviours, increase socialisation and improve mood (Choi, Soo Lee, Cheong & Lee, 2009; Gerdner, 2000: Guetin et al., 2009; Svansdottir & Snaedal, 2006; Sung, Lee, Li & Watson, 2012; Wall & Duffy, 2010).The key to successful instrument playing is described in this book, which is knowing symptoms of cognitive impairment/dementia, and then adapting the music and activities to cater for these deficits. For eg the Among My Souvenirs Activity Handbook includes easy to read diagrams on where to seat people with cognitive impairment/dementia when playing instruments, and what instruments result in maximum participation. Is the song in the right musical key for the person to sing along to? Is the speed of the song slow enough for the person with dementia related language deficits to sing along to? Does the song have a lot of words (for eg verses) that the person with dementia just doesn’t remember? The CD Among My Souvenirs: Therapeutic Songs For People With Dementia contains 51 pre-recorded songs in specific musical keys and rhythms to ensure that both men and women with cognitive impairment can sing along to them comfortably and enjoyably! To find out more about my work, you can view the documentary on my work with people with dementia Forgotten Notes at my website. Another Music Therapy Technique is Song Writing, which I have used very effectively with carers of people with dementia. I captured their experiences of living with and caring for a Person with Dementia 24/7 and put their experiences to music. I was fortunate, through Carers Victoria (Australia) to receive funding to arrange and record 11 songs which capture the amazing and challenging experiences of these carers. This CD and the lyrics are free and can be downloaded via my website. 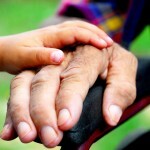 I hope you find these Music Therapy Resources as rewarding as I have found them. You will find Among My Souvenirs: Music Activity Pack a valuable purchase for any staff wanting to conduct an effective Music Therapy session with either individuals or groups with dementia. You will be able to use this Planned Activity Program time and time again, with great job satisfaction, witnessing the people with dementia engaging in the music activities. The CD and handbook can be purchased via my website from anyone in America, UK, Ireland and New Zealand (with the CD available for digital download). Check out the CD and handbook also on my website for people interested in conducting a choir for people with dementia at . I can be contacted on loretta@drlorettaquinn.com or directly through my website. Dr Loretta Quinn is an accomplished Dementia Professional in the field of Dementia and Aged Care, both as a Registered Music Therapist and a Registered Nurse (Div1). Her passion for Dementia and Aged Care and her diverse knowledge in this area is unsurpassed. Loretta an invaluable asset to the International Aged Care Industry. ~ Sue Leake, Manager, Commonwealth Carers and Respite Centre, Melbourne, Australia, January, 2014.